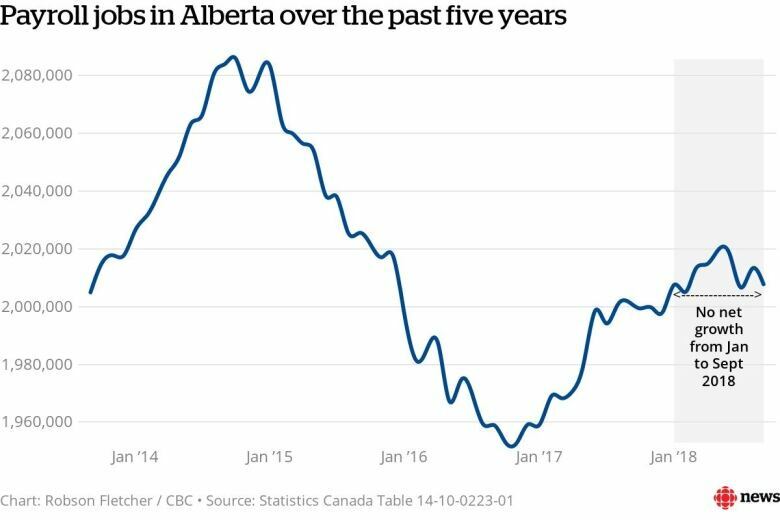 The roller-coaster that is Alberta's economy plunged in 2015 and 2016, and then started climbing back up in 2017. But now, we've hit a flat spot. And we're only just starting to see what lies around the next bend. This story was originally published Thursday, Dec. 6. If Alberta's economy is a roller-coaster, the past four years have been enough to give us whiplash. In 2015 and 2016, we plunged. The recession — worst in a generation. Then, in 2017, we started to climb back. Word of this hopeful turn was met with some skepticism at first, but the data supported it. Yes, things were still painful around the province, but a recovery had begun. That upward momentum carried us up until the beginning of 2018. But roughly midway through the year, the recovery began to sputter. We've been trending flat, or downward, on several key economic measures since. 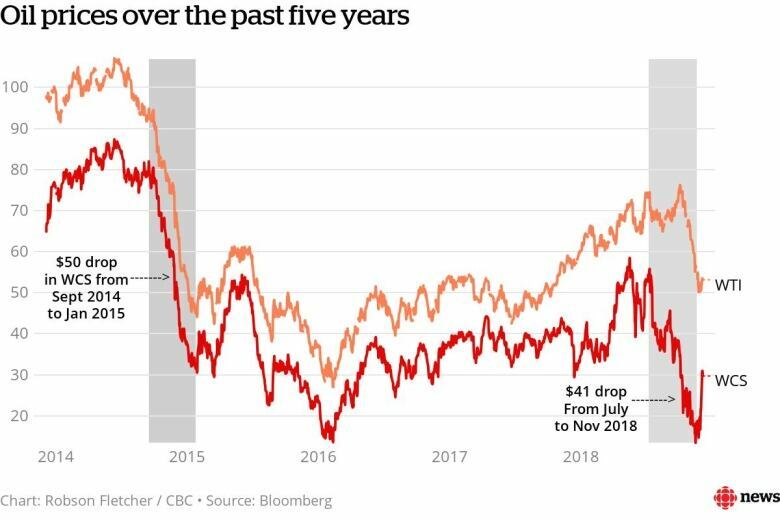 Underlying all this has been the plunge in oil prices — or, more specifically, the plunge in prices for Western Canadian Select. Our crude, as we've heard countless times in the past few months, has been trading at a huge discount compared to the West Texas Intermediate benchmark. 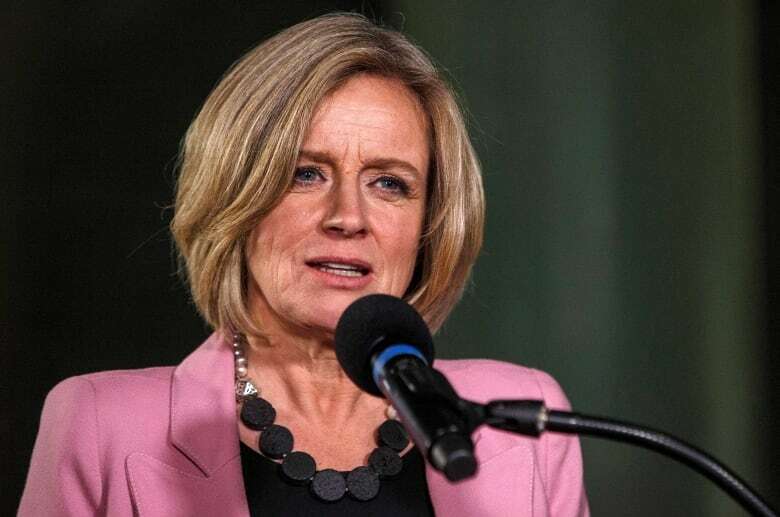 In response, the Alberta government — with the rare backing of opposition leaders — ordered a mandatory curtailment of oil production aimed at closing that price differential. The question now: Will this extraordinary step get us back on the upward track? There's a lot riding on the answer. People's livelihoods. People's lives. The reality, though, is that we simply don't know — yet. It's still too soon to see, exactly, what lies around the next bend. But if we look carefully at the topsy-turvy route that has led us to where we are now, we can maybe catch a glimpse of where we're headed. Like figuring out if there's something wrong with your car engine, diagnosing the health of Alberta's economy can be complicated. It can take an expert to tell if that noise it's been making is normal — or a symptom of something seriously wrong. And even then, experts might disagree. 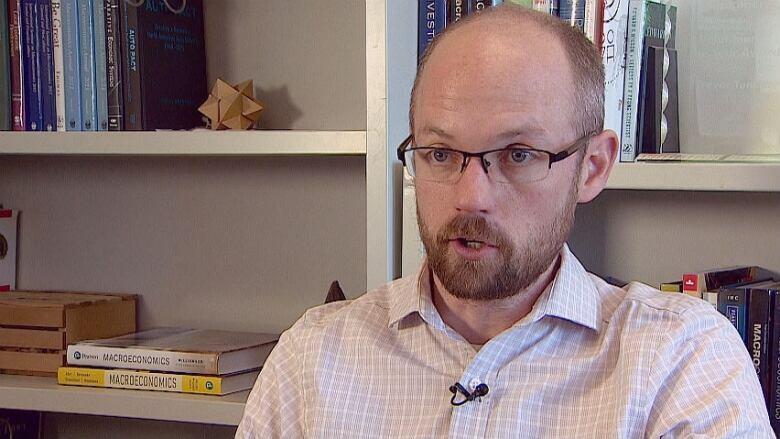 University of Calgary economist Trevor Tombe has been listening closely to Alberta's economic engine and, overall, he says it would be fair to describe it as "sputtering." "Sputtering is an interesting word because there are periods of positive news and periods of less positive news as we kind of go up and down," he said. "But broadly, across a whole range of monthly indicators, the pace of recovery has certainly fallen off." Some parts of the economy sound just fine to Tombe's ear. Retail sales and wholesale trade both hit record highs this year, for example, and manufacturing is also up. So it's humming along, on those fronts. But when it comes to what's on so many Albertans' minds these days — jobs — things are sounding a lot clunkier. During the province's recession, Alberta shed about 130,000 payroll jobs, from January 2015 to October 2016. Things hit rock bottom at the end of 2016, but then started to bounce back. By January of this year, we had regained 55,000 payroll jobs. By May, we added another 12,000 on top of that. Since then, however, we've been backsliding. By September (the latest month for which data is available), we had erased nearly all the job gains we had seen in the first five months of the year. At the same time, Alberta's unemployment rate has been creeping back up. And Calgary continues to have it worse than Edmonton. The gap between the cities widened during the recession, then narrowed in 2017. But, so far this year, it's been growing again, too. At last count, Calgary's unemployment rate stood at 8.2 per cent while Edmonton's was nearly two percentage points lower. Of course, jobs are just one part of the employment picture. Wages are another. And those have been flat. In September, the total income earned by workers in Alberta amounted to $13.4 billion. That sounds like a lot of money, and it is. But it's been unchanged for nearly a year. Back in December 2017, the province's overall labour compensation was virtually identical. 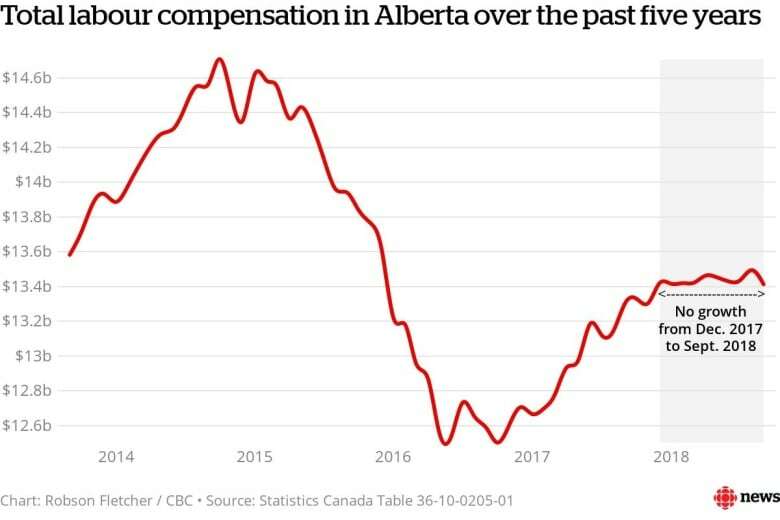 "I think it's that total labour compensation graph that shows it in a pretty stark way," Tombe said of Alberta's economic condition. "It's just kind of flatlined for the past many months. And that measure, alone, right there is 50 per cent of GDP." When Alberta experienced a similar wage plunge during the 2008 recession, Tombe noted, it took just over two years for things to get back to where they had previously been. But recovering from this latest recession is taking much longer. It's now been almost four years since labour compensation peaked and we're still $1.3 billion below that level. So, what's thrown a wrench into our recovery? Underlying these grim numbers is that persistently low price that our oil has been fetching on world markets for the latter half of this year. To put the recent drop in perspective, just compare it to the oil-price crash in late 2014 that triggered the recession. Back then, the price of Western Canadian Select (WCS) fell off a cliff, plunging $50 in the span of four months. Things haven't been quite that bad in late 2018, but it's been close. The WCS price fell $41 from July to November. Just this week, after the premier's controversial decision to mandate oil-production cuts of 325,000 barrels per day (or roughly 8.7 per cent) starting in January, the price for WCS surged. You can see that at bottom right in the chart above — the red line's sudden, upward spike. But the question remains, will prices continue to climb? And will that be enough to mitigate the damage done to a fragile recovery? Of course, no one can give a definitive answer, but Rory Johnston can offer an educated guess. He's a commodity economist with Scotiabank Economics who studies Alberta's oilpatch, and he now expects prices for WTI to hover in the low-$60 range for the beginning of 2019, with WCS about $20 below that. "At those levels, I think we're not going to see gangbusters growth, but we're likely going to see that stem the bleeding," he said. "So I think that is a net positive for employment prospects." The forecast, Johnston cautions, comes will all sorts of caveats. Plenty of things remain to be seen, including the government's curtailment plan itself — how it's rolled out, how it's monitored, how it's adjusted. In announcing the plan, even Premier Rachel Notley wouldn't say with certainty that the move would necessarily save jobs. "Our best guess, is that this intervention will provide the kind of predictability and stability to industry players to allow them to keep people on, because they can see a light at the end of the tunnel," she said. "We're hoping it will have a neutral-to-positive impact on jobs, going forward." Given the alternative, Tombe figures the government had little choice. Doing nothing, he said, would mean an even higher risk of businesses pulling back on investments and scaling back employment. "It was a big price drop (in WCS), and so that risk was very real," Tombe said. "And I think that's why we saw the government take the action that it did, rather than just wait and see." If these recent moves help close the oil price differential and increase government revenue, if they provide business some measure of stability and stave off future job losses, and if wages were then to begin to climb, then it's possible our recovery will, itself, recover. The oil-production mandate takes effect in January, and it will take time for industry and markets to react. 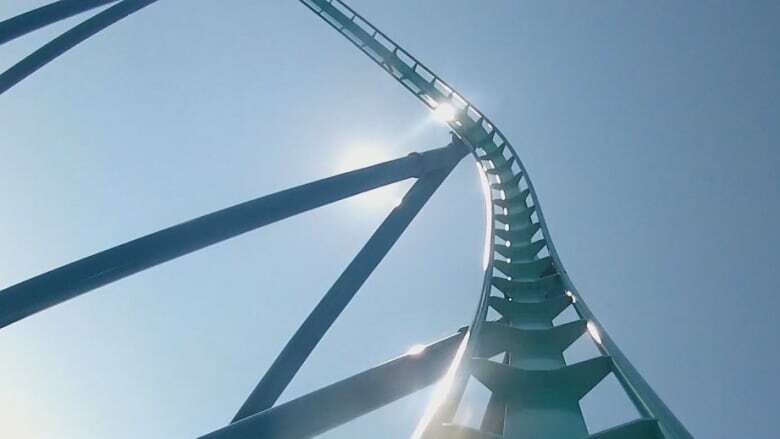 So, just in time for a spring election, we might have a clear view of where this roller-coaster goes next. 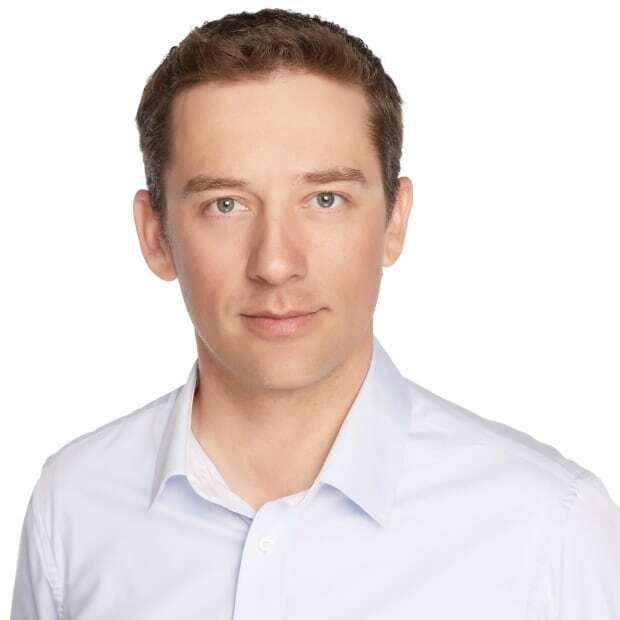 Robson Fletcher joined the CBC Calgary digital team in 2015 after spending the previous decade working as a reporter and editor at newspapers in Alberta, British Columbia and Manitoba.